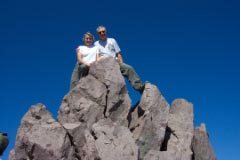 We're Bill and Nancy Bamberger, two retired seniors who like to travel. This website documents some of our trips and hikes. We hope you find the site informative and interesting. Click on the Map to see where we've been. Comments About Our Website. We get lots of comments from readers. We appreciate all the feedback and suggestions. You can send us an with your comments. If you have a question, we will try to reply promptly. Click here to see what some readers are saying about our website. 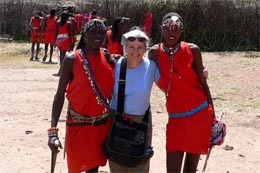 Nancy's travel journals are her personal account of our trips. They contain lots of photos and details about the places we've gone. We enjoy hiking and often combine our love of travel with hiking. We've created a section on the website that contains photos of some of our hikes. Rio Grande River, Big Bend occupies 118 miles of the border with Mexico. The park includes deserts, mountains canyons, and hosts an exceptional diversity of plant and animal habitats. Mosel Rivers, including Belgium, the Netherlands, Germany, France and Switzerland. Before the cruise we spent a few days on our own in Brussels and Bruges. When we're not traveling, we spend a lot to time on our non-profit, the Cambodian Village Fund, working to improve the educational opportunities for the children in rural Cambodia. To learn more, or to donate to the fund, click here.